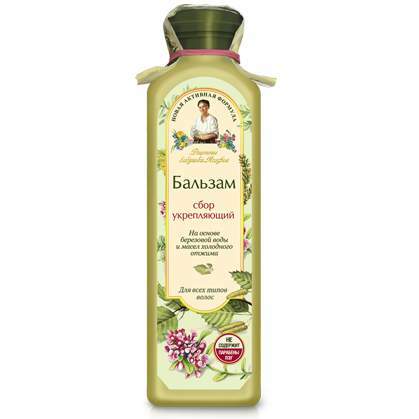 Strengthening Herbal Conditioner is produced by the Russian beauty brand Granny Agafia’s Recipes. The product is formulated with birch bud extract and other herbal ingredients. The formula is based on birch bud extract which effectively strengthens hair follicles and roots, preventing hair loss. A carefully selected combination of Siberian herbs (nettle, lemon balm, yarrow, marshmallow, heather, sweet flag) helps to prevent brittle hair and split ends, strengthening the hair along its entire length. The conditioner also contains cold pressed oils which give it a delicate texture, help to restore the hair structure and make combing and styling easier. Directions. Apply onto wet, clean hair. Spread evenly along the entire length. Leave for 1-2 minutes. Rinse with water. Ingredients. Aqua with infusion of Betula Alba Bud, enriched by olis: Arctium Lappa, Rosa Daurica, Pinus Pumila; Extracts: Urtica Dioica, Hypericum Perforatum, Melissa Officinalis, Achilea Millefollum, Athaea Officinalis, Caluna Vulgaris, Acorus Calamus, Tussilago Farfara; Cetrimonium Chloride, Cetearyl Alcohol, Guar Gum, White Beeswax, Flower Wax, Tocopherol (vitamin E), Niacinamide (vitamin PP), Glucosamine, Citric Acid, Parfum, Benzoic Acid, Sorbic Acid, Benzyl Alcohol. Want to buy Strengthening Herbal Conditioner? Call us or submit your order via our web site!